These Goliath drug developers are combining in a massive $74 billion deal. Check out the latest Bristol-Meyers Squibb and Celgene earnings call transcripts. The opportunity to secure potential best-selling drugs before they win FDA approval convinced pharmaceutical giant Bristol-Myers Squibb (NYSE:BMY) to acquire biotechnology giant Celgene (NASDAQ:CELG) on Jan. 3. The deal, which is worth about $74 billion, creates a biopharma Goliath with nearly $40 billion in combined, annualized revenue exiting the third quarter. Here's what Celgene investors need to know about this deal. Bristol-Myers Squibb is giving Celgene investors $50 per share, one share of Bristol-Myers Squibb stock, and a contingent value right (CVR) that provides a one-time, $9-per-share bonus if Celgene's ozanimod, liso-cel, and bb2121 secure FDA approval. The cash portion of this deal to be paid upon closing will come from cash on hand and debt that's already been lined up from lenders, including Morgan Stanley. Once the merger is complete, Bristol-Myers shareholders will own 69% of the combined company, while Celgene investors will own the remaining 31%. Is it a good deal for Celgene owners? The deal valued Celgene at $102.43 per share, plus the CVR, prior to the market opening on Jan. 3. That represents a 54% premium to Celgene's share price on Jan. 2, the day prior to the agreement's announcement, yet many investors could still be disappointed by the amount they're getting. Celgene's shares traded at more than $140 as recently as 2017, and they spent a considerable amount of time trading north of $100 between 2014 and 2017. Therefore, Bristol-Myers' offer price could be shy of price paid by many Celgene investors. For them, this deal will only makes sense if they hold the Bristol-Myers Squibb shares they acquire in this deal and those shares prove to be a good long-term investment. The good news is that Bristol-Myers is a highly profitable and growing company. However, the bad news is that on a stand-alone basis, Bristol-Myers isn't nearly as profitable or fast growing as Celgene. In the third quarter, Bristol-Myers Squibb and Celgene's revenue grew 8% and 18%, respectively, and over the past 12 months, Celgene's operating margin was considerably better than Bristol-Myers Squibb's. 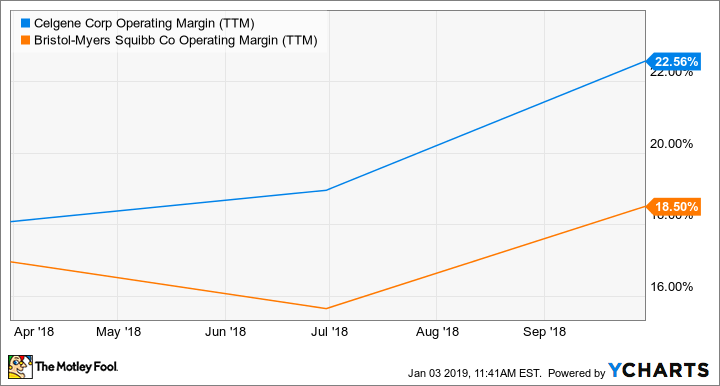 CELG Operating Margin (TTM) data by YCharts. Arguably, Celgene's faster growth and better profitability mean it offers more upside opportunity on its own than as a combined company; however, that thinking may underestimate the uncertainty associated with patent expiration and FDA approvals. The multiple myeloma drug Revlimid accounts for about two-thirds of Celgene's product sales, and generic alternatives to it can launch under licensing agreements as soon as 2022. Generic drug launches could cause Revlimid sales to decline significantly, increasing the pressure on Celgene's pipeline to produce blockbusters that can win approval. However, there's no guarantee Celgene's most-promising drugs will secure FDA approvals (hence the CVR associated with their approval), and if they don't, Celgene could tumble. This uncertainty suggests that doing this deal is savvy. Celgene's greater profitability and growth rate should boost metrics at the combined company, and importantly, the combined company will generate a lot of cash to support R&D, buybacks, deals, and dividends. Currently, Bristol-Myers shares yield 3.25%, and when this deal closes, Bristol-Myers Squibb already plans to repurchase up to $5 billion in shares via an accelerated purchase agreement. Acquiring Celgene is expected to increase Bristol-Myers Squibb's earnings per share by 40% or more in the first full year after the merger, and the combined company is expected to produce a staggering $45 billion in cash flow during the first three full years after closing. If so, then the combined company should be able to withstand headwinds associated with Revlimid or regulatory setbacks better than Celgene could on its own. Bristol-Myers Squibb has six near-term products representing up to $15 billion in revenue opportunity that could launch in the next few years following this deal. That opportunity, plus the opportunity to grow sales for drugs it already owns, including Opdivo, a multibillion-dollar oncology drug, make Bristol-Myers one of the most intriguing large pharmaceutical stocks investors can buy. For this reason, I plan to hold onto my shares in the combined company once this deal is done.